Apartment 2 is the biggest of our apartments with about 110m². It splits into four rooms, a kitchen, two bathrooms and a small corridor. We restored the timber floor and doors in the apartment which offers occupation for four people. Our guests have the option to stay in apartment 2 including the music room or without the music room (grand piano Bechstein). The veranda is a small room (7m²) with four windows. During daylight it is very bright in here so we chose deep red as the wall paint. It offers nice seating facilities to enjoy the view of the garden. The music room measures 20m². 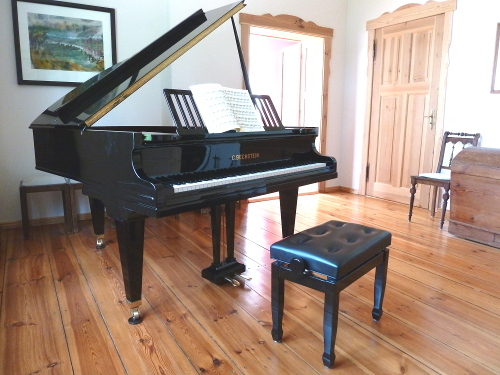 The Bechstein grand piano is the main feature of the room. Guests are welcome to play on it. Choir clubs like to make use of the offer with its good acoustics to make music. The living room measures 20m² and is arranged with furniture of the Biedermeier period. A modern sofa bed offers occupation for two (160 x 200 cm). A projector, a large retractable screen plus a surround sound system are available. The 20m² large kitchen combines modern with older furniture. With a large table it is a cozy and welcoming place for good food and drinks in a nice atmosphere. It is equipped with: Hob and oven, espresso machine, kettle, toaster, dishwasher and refrigerator. The bedroom contains two beds for one person, a blanket box and a cupboard on 10m². The first bathroom has a bath tub on 5m². The second bathroom offers a modern and open shower on 6 m². Unfortunately we cannot allow pets in our apartment. Smoking is unwanted as well. If the planned duration of your stay differs from the offered duration please inquire possible additional costs with us. 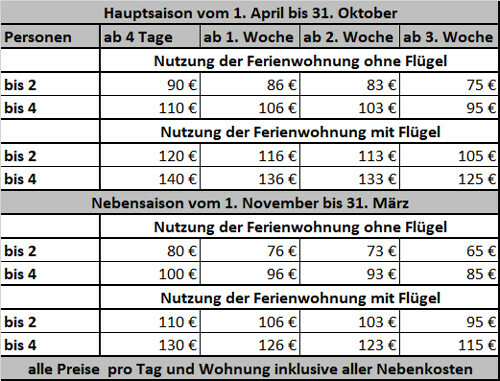 The local policy requires us to charge visitor’s tax.